Herkert, Barbara. A Boy, a Mouse, and a Spider: The Story of E.B. White. Illus.Lauren Castillo. New York: Henry Holt Co., 2017. A quiet, fearful, sickly boy, Elwyn, or later Andy, and still later E.B., took solace in wild animals and nature. Later, in college, he wrote for a newspaper, regaled his nieces and nephews with stories, and dreamed of book characters. As an adult and family man, he moved to Maine to escape the city and create a peaceful existence. From all of this sprang his beloved stories, particularly, Stuart Little and Charlotte’s Web. The digital, ink, and watercolor illustrations look as if they were childlike period pieces. And the poetic short prose writing adds to the feel of his life. This picture book biography concludes with a photo of White, an author’s note of additional information, and a short bibliography. White’s story demonstrates the power of life experiences as an inspiration for writing fiction. ​Harvey, Jeanne Walker. Maya Lin Artist-Architect of Light and Lines: Designer of the Vietnam Veterans Memorial. Illus. Dow Phumiruk. New York: Henry Holt and Company, 2017. ​​Tavares, Matt. 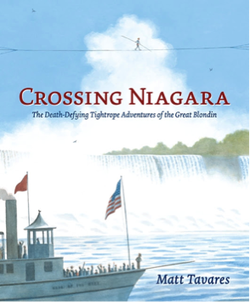 Crossing Niagara: The Death Defying Tightrope Adventures of the Great Blondin. Candlewick Press, 2016. This over-sized picture book biography is illustrated with stunning paintings that vary in perspective, layout, and color palette that make the story of the Great Blondin come alive. A tight rope walker as a child, Blondin later worked for a circus, but longed for a greater feat. He gained permission, prepared the ropes, and to a huge crowd’s astonishment, walked over Niagara Falls from the United States to Canada – then back again! He repeated the performance many times, each time adding new tricks, and even once balancing his manager on his shoulders. He then toured the world performing his skills. An author’s endnote gives further biographical information, including the fact that the Great Blondin perfected and performed over a sixty-five year period. A selected bibliography follows the author’s note. Gray, Karlin. Nadia: The Girl Who couldn't Sit Still. Illus. by Christina Davenier. Houghton Mifflin Harcour, 2015. As a little girl in the 1960's in Romania, Nadia would climb trees in the forest, rides bicycles fast, and eventually have the chance to attend a school that offered gymnastics lessons. Coached by the famous Karolyi's, she joined the 1976 Olympic gymnastics team and earned the first ever score of 10 in gymnastics, and then earned six more. She starred in the 1980 Olympics as well, as has remained in Olympic history. This light hearted, watercolor illustrated biography is completed with more information about her life, including her defection to Hungary, a time line, source notes, and selected list of books and websites. The back flap copy includes photos of a gold-medaled Nadia. ​Steptoe, Javaka. Radiant Child: The Story of Young Artist Jean-Michel Basquiat. Little, Brown and Company, 2016. Illustrated in the style of Basquiat’s bold work, Steptoe reveals the artist’s life from boyhood in Brooklyn, painting the life of the city, and attempting to create a masterpiece. Jean-Michel’s artistic mother was his influence, surrounding him with art and experiences, until her mental health failed and was institutionalized. Battle continued to create to understand his world. He moved to Manhattan to paint and write poems everywhere he could, until he’s noticed by those influential in the art world, who supported him. Basquiat’s story is told poetically, with deep emotion, and the book ends with additional information about his life, work, Steptoe’s interpretive illustrations, and a bibliography. Rubin, Susan Goldman. Stand There! She Shouted: The Invinsible Photographer Julia Margaret Cameron. Illus. Bagram Ibatoulline. Candlewick Press, 2015. She was an unorthodox, European woman for the early 1900’s: unusually emotional, intellectual, and not at all concerned with her appearance. But she loved beauty, and became an accomplished, yet demanding photographer. Julia is credited with being one of the first to perfect the art of portraiture in photography. This short chapter book biography is a beautiful package, with large, quick reading font, alternating photographs and paintings as illustrations, and pleasing paper quality and layout. The book concludes with extensive source notes, a bibliography that includes Julia’s own writing, a list of museums that display her work, photo credits, and an index. Snyder, Laurel. Swan: The Life and Dance of Anna Pavlova. Illus. Julie Morstad. Chronicle Books, 2015. Both the text and the illustrations, and even the physical height of the book, offer a sense of grandeur to Anna's life. The lyrical text, sprinkled with quotations, is sandwiched between end pages that depict her early life to her ultimate success. Anna's sacrifices and hard work is revealed, as is her ways of sharing her success with the world. The whole package, all very dramatic, finishes with a bibliography and source notes. Herkert, Barbara. Mary Cassatt: Extraordinary Impressionistic Painter. Illus. Gabi Swiatkowska. Henry Holt and Company, 2015. This picture book biography of Cassatt is told in very spare text, allowing the illustrations to do most of the storytelling. She's shown as a very serious, determined girl, outside of the traditional expectations of her day. And her growth through the support of other artists is revealed. The paintings are very much in Cassatt's style, and give an authentic feel for the work of the artist. The book concludes with an author's note and sources. Macy, Sue. Miss Mary Reporting: The True Story of Sportswriter Mary Garber. Illus. C.F. Payne. Simon and Schuster Books for Young Readers, 2016. This rollicking fun book, written in an engaging style, liberally sprinkled with quotations, is illustrated in Norman Rockwell-like paintings, that show the unique character of Mary. Even as a young child, she loved all sports -- playing, watching, and reading about them. During WWII, she was given a break into newspaper sports writing for high school and college teams. After the war, she felt discrimination when he was demoted. But she worked on, especially covering African American and women's teams, and made a name for herself over a fifty year career span. The book concludes with an author's note, time line, resources, and source notes. McPhail, David. Beatrix Potter and Her Paint Box. Henry Holt and Company, 2015. Rendered in classic dreamy, impressionistic McPhail style, the water color illustrations take on the bulk of the story. He focuses on her childhood and growing love of painting. The very brief text concludes with Potter creating "The Tale of Peter Rabbit" for a friend's ill child, and how her "little books for little hands" grew to world wide acclaim. ​Cline-Ransome, Lesa. My Story, My Dance: Robert Battle’s Journey to Alvin Ailey. Illus. James E. Ransome. Simon & Schuster Books for Young Readers, 2015. This picture book biography begins with a foreword by Battle himself, sharing a bit of his children, introduction to dance and how it changed his life, and setting the stage for the reader. Raised by his loving, creative, musical aunt, Robert soon began to sing and play the piano. Having been born with bowed legs, however, required him to wear braces to strengthen his legs, and eventually he learned to walk. He trained in karate to keep himself safe on the streets of Miami, Florida, and fell in love the rhythmic, almost dance like moves. He started ballet lessons late, as a 13-year-old, but with hard work and dedicated teachers, he progressed quickly, and was accepted into Julliard. Robert created his own dance company, and then was recruited by Alvin Ailey, eventually becoming the artistic director. Cline-Ransome tell Battle’s story lovingly, and Ransome illustrates it with color, boldness, passion, and movement. The back matter includes and author’s note, illustrator’s note, and list of sources. Vernick, Audrey. The Kid from Diamond Street: The Extraordinary Story of Baseball Legend Edith Houghton. Illus. Steven Salerno. Clarion Books, 2016. During the early 1900's, ten-year-old Edith was "magic on the field." She was so good, she began playing professional baseball on the Philadelphia Bobbies, a women's team, as a child, and competed against male teams. Edith eventually traveled the United States, and toured Japan. Vernick tells a story, filled with quotations, that children will love; Salerno furthers the story with period-like illustrations that bring Edith to life. The back matter includes an author's notes of life beyond the Bobbies, and sepia photos of Edith and her team. ​Friedman, Samantha. Matisse’s Garden. Illus. Cristina Amodeo with reproductions of works by Henri Matisse. The Museum of Modern Art, New York, 2014. In spare, yet powerful text, and simple, yet fluid illustrations, this picture book biography relates the story of Matisse’s art in his final years. Made from cut, hand painted paper, Mattise’s creations are paired with Amodeo’s renditions of him at work. The book ends with additional biographical notes, identifying notes on the reproduced artwork, and photo credits. This is a small treasure of a title.